Most boaters will agree that food tastes better straight off the grill—particularly on a warm summer day, after you spend many hours out on the water. Waterfront restaurants and bars are generally pretty convenient, but you’re often limited by access, hours of operation, and menu options. Luckily, having the ability and the right tools to fire up your own marine grill while onboard can help to solve these problems. Just like cooking on land, there’s always safety to keep in mind regardless of whether you are using a gas, charcoal or electric grill. It’s also important to note that you must use a grill designed and approved for marine use—so don’t even think about dragging out the rusty old grill from the backyard. Here at Boat Trader, we’re happy to help get things sizzling on the water. 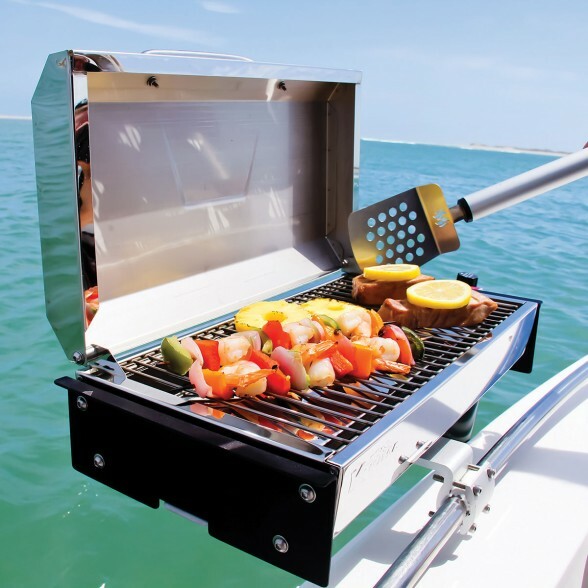 Check out our tips on how to choose the best boat grill. 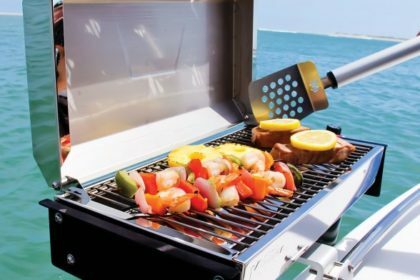 If you’re ready to get things sizzling on the water, start by check out your options for the best marine grills. Photo Courtesy: Sea Ray Boats. Successful grilling all depends on the amount of heat that is applied, both directly and indirectly. It’s also important to keep in mind the size of your boat, how much grilling you’ll be doing, and your ideal budget. When it comes to choosing a marine grill for your boat, the first decision to make is between gas, charcoal or electric. Each of these options varies in the amount of heat they produce and the way they preheat. For example, gas (or propane) grills are known to preheat quicker than charcoal. Gas grills have become one of the most popular grills for on board use and they come in a variety of sizes. The fact that propane fuel is so cheap and widely available makes these grills a go-to choice for boaters. Not to mention, the smaller disposable fuel bottles can be used on even the largest grills and are still be easy to store. You’ll find propane grills that start in the $200 range and go all the way up into the $1,000s. While affordable and user-friendly, boaters still need to be cautious of gas leaks and the potential to ignite in the right conditions. This Kuuma Product’s Profile 150 Propane Gas Grill with Regulator is one of many options on the market for buyers in search of a propane marine grill. Similar to gas, charcoal grills are another top choice for boaters. Many grilling enthusiasts are eager to share their love for charcoal, arguing that you can’t beat the taste of meat seared above this kind of flame. These grills tend to cook a lot slower than gas or electric, but charcoal is readily available and generally easy to light. Boaters should always follow the manufacturers recommendations when it comes to lighting the grill. A downside to marine charcoal grills is that they can be difficult to store. They need to be kept dry and they tend to take up a large amount of space. One of the most common charcoal grills used onboard is a small, round stainless steel grill that can clamp onto almost any handrail or slide into a rod holder. The prices of marine charcoal grills are attractive at just around $150 or $200. Magma is one of the most popular marine grill brands available for boaters, offering charcoal and gas options. Unlike gas or charcoal, electric grills require that you have a reliable source of AC power on board—either from shorepower or a generator. 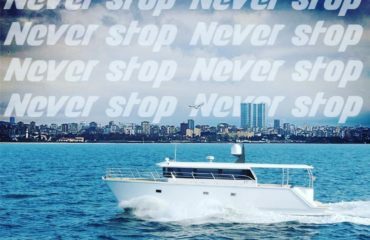 Lately we’ve seen a trend with many boat manufacturers who have started to include built-in electric grills into their larger models. 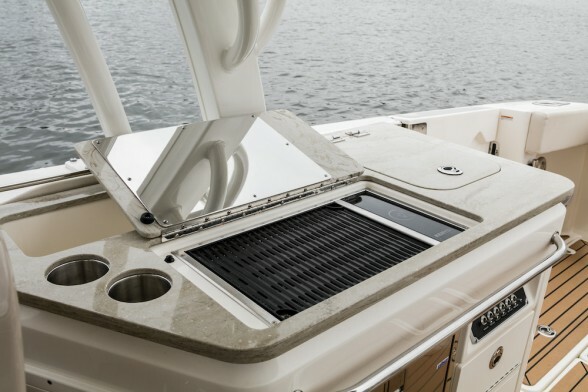 Typically these grills are placed up on the flybridge or in another dedicated area, permanently installed in the vessel. It’s no surprise that the disadvantage of electric grills is focused around their cost, which is significantly higher than propane grills and charcoal grills. Another obstacle is finding the right amount of electricity needed to operate the grill. On the other hand, electric grills do come with a few distinct benefits. First, lack of an open flame means you may be able to use your electric grill in places where charcoal or propane grills are banned, such as at a dock or in a marina. This lack of an open flame also means that these grills are much safer to use than their gas and charcoal counterparts. Similar to gas grills, the price range for an electric grill can vary immensely depending on size and accessories. A growing trend among larger boat models is the addition of a built-in electronic grill. 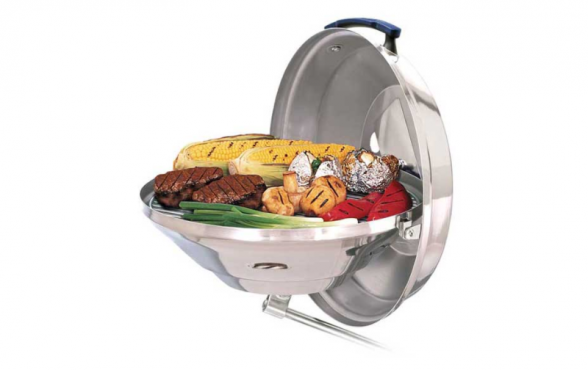 Once you’ve made your choice between gas, charcoal or electric, you’ll want to accessorize with all the usual grilling necessities—utensils, mounts, covers, lighters, a grilling light, storage containers, aprons and more. Oh, and don’t forget the grub. When it comes to safety, always remember that you should never grill while underway. When you’re onboard, never leave a lit grill unattended, even for just a minute. Also, we strongly advise that you never use gasoline or any other non-approved accelerant to light a marine charcoal grill. Be sure to double check that all propane connections are sealed tight. If you believe you have a leak, check your connections with soapy water—if bubbles form when brushed onto a joint, then you have a leak. Don’t forget to ensure that embers never fall from the grill onto any part of the boat. And of course, be sure to turn off or put out the grill as soon as you’re finished. Once it cools down, detach and store your grill before you get underway again. Prior to heading out on the water, you can save yourself time and avoid stress by pre-chopping your veggies and marinating your meats. Bring along storage containers and Ziploc baggies to help with leftovers and cleanup following your meal. And speaking of cleanup, be sure to give it the time and effort it deserves to keep your boat—and your marine grill—in shipshape.